Four years ago, the story coming out of the 2010 midterm elections was what newly Republican-controlled state governments would do in power. The tale from the 2014 postmortems has been much the same. Indeed, Republicans now control both chambers of state legislatures and gubernatorial seats in 23 states (see map below).1 That can and will have a significant impact on policy-making in states covering most of the regions of the country. It could also influence the way in which the 2016 presidential primary calendar develops and hardens throughout 2015. 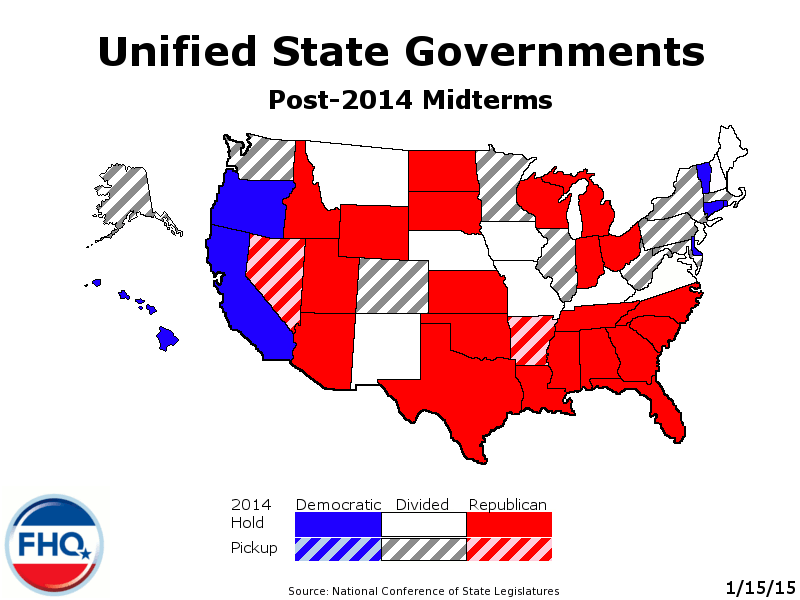 Whether a state government is unified or divided along partisan lines is a factor in the calculus that state governmental actors go through when making the decision to shift the date of the state's presidential primary.2 Again, Republicans have stretched their advantage in state government over the last four years. Yet, conditions are different in 2011 than they are in 2015. State governmental control may play a role in any subsequent primary movement, but it plays a smaller role than other factors. That is consistent with what FHQ has found for the 1976-2008 period. Throughout that span structural, state-level factors played a much larger role in the determination to shift the date of a primary. 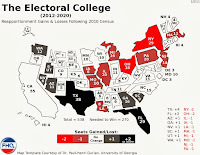 For instance, a state such as Arkansas in 2015 is forced to decide between moving the presidential primary together with the primaries for state and local offices or creating a separate presidential primary election that can be moved more easily but incurs the cost of funding that new, separate election. That is a sterner test than in a state like Florida where the presidential primary was separate at the outset of the post-reform era. The costs of moving are greater in Arkansas than in Florida. Incumbency in the White House also matters in this calculus. This may differ in the currently more polarized era, but in the 1976-2008 period, the floodgates have tended to open up in terms of primary movement in years in which both parties have competitive presidential nomination races. In other words, if there is no incumbent seeking reelection, both parties members in state government are potentially more motivated to help their party -- whether candidates, their state or the partisan voters in the state -- to gain some advantage. Actors on the state governmental level are hypothetically more cautious when an incumbent is running for reelection. Partisan conflicts are more likely to occur when one party is attempting to reelect a president while the other is trying to determine which candidate would be best suited to unseating that incumbent. The I'll scratch your back if you'll scratch mine mindset gives way to its every man for himself. The interesting thing is that the 2012 and 2016 cycles may break from that pattern to some extent. 2012 saw a significant amount of primary movement for a year in which an incumbent was seeking reelection. By comparison, 2016 is off to a much slower start (despite both parties having open nomination contests). The reason is the semi-coordinated rules changes between 2008 and 2012. 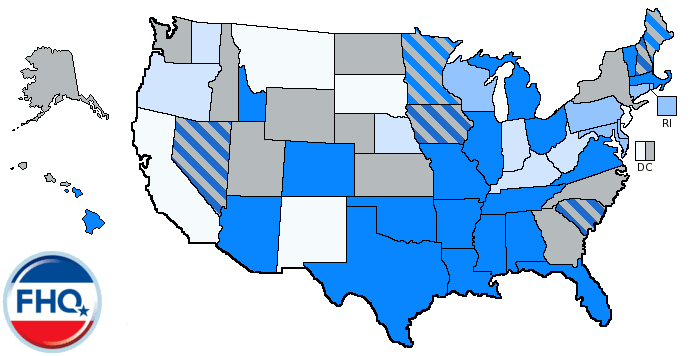 Both the Democratic National Committee and the Republican National Committee allowed states to hold delegate selection events in February for the 2008 cycle.3 That resulted in a primary calendar in 2008 that began on the heels of New Years, stretching the calendar and in some respects the process out. Neither wanted repeat of that in 2012. The solution was an informal agreement to shift the start point back to February with the majority of states -- those other than the four carve-out states -- being restricted to March or later dates. That change put 18 primary states in the national parties' crosshairs in January 2011. 18 states had laws calling for February (or earlier) presidential primaries. That significantly reshaped the primary movement calculus in those states. Those states had to move in order to comply with the new rules and avoid the penalties associated with violating them. 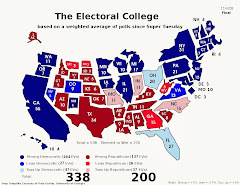 As the map below demonstrates, that same pressure from the national parties will not exist in 2015 as the 2016 primary calendar is being finalized in state capitals across the country. 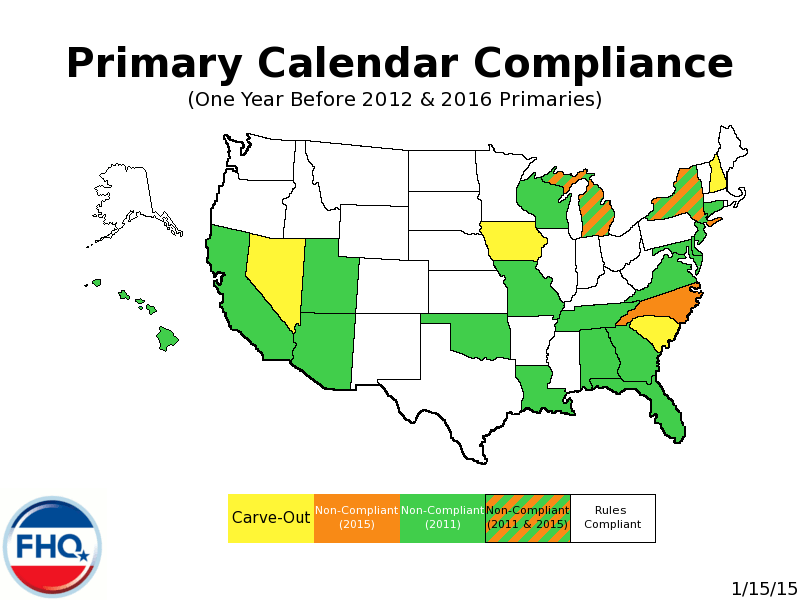 There are only three states -- Michigan, New York and North Carolina -- that are officially slated to hold non-compliant presidential primaries in 2016. Michigan has already signaled that a move to March is likely there. And New York is only back in February because the 2011 primary date change was passed with a sunset provision. That leaves only North Carolina. ...and other states that might want to go rogue, breaking the national parties' rules on timing. But that brings us back full circle to the unified control factor. One could hypothesize that with so many Republican-controlled states and a significant increase in the Republican penalty associated with holding a pre-March primary (or caucus) that the stars have potentially aligned to produce an orderly primary calendar. Perhaps put more precisely, the parties may have devised the best way of combatting such frontloading activity than has been the case in the past. There are 23 Republican-controlled states that the more severe RNC penalty may help keep in line. Past scofflaws (and Republican-controlled states) -- Arizona, Florida and Michigan -- have either disarmed or look to be in the process of disarming. However, attempts at going rogue during the 2016 cycle have thus far occurred in Republican-controlled states (Arizona, North Carolina and Utah). The fact that Arizona is on both lists says something about intra-party divisions. That is not something confined to just Arizona either. North Carolina has seen a number of issues put its Republican-controlled Senate at odds with its Republican-controlled House. On the surface, then, it may look as if the combination of more severe RNC penalties and an expansion of Republican-controlled states would help reign in any potential 2016 rogues. But it is more complicated than that. If we really want to see the potential impact of partisan control of state governments on this process, the best test may not in Republican states where there is a willingness to break the rules. Rather, the better test may be in Republican-controlled states and the ease with which they form regional and subregional primaries. 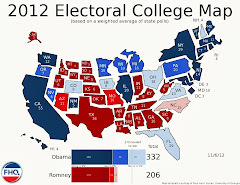 1 That is a slight increase over the 20 state governments the Republican Party controlled following the 2010 elections. 2 To see a similar examination of these factor from 2011 see here and here. 3 That was not new in 2008. Both parties allowed February contests in 2004, but only the Democratic Party had a nomination race that cycle. Why is Florida on March 1 and Not March 15?